1.Dip tortillas in the melted pork butter and drain excess. 2.Slightly “brown” the tortillas on a griddle. 3.Pour chipotle sauce and green sauce over the tortillas. 4.Add the shredded beef and chopped white onions. 1.Place water to boil and add the tomato. When water is boiling add the garlic, onions and the chile serrano. Let rest for several minutes. Rinse and mix the ingredients inside a blender. 2.Pour a tablespoon of oil into a pan and add the salsa. Let it boil and remove the foam. 3.Blend a cup of salsa with the coriander, add salt, and return it to the pan. Add the chicken broth for flavor. 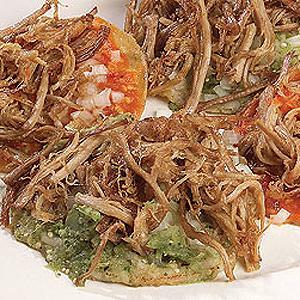 This entry was posted in Mexico and tagged Chalupas, Green Salsa Recipe, Recipes.